Meeting on the 13 April at Bullet race cars , 1 Ant St Yatala , 11.00 AM. 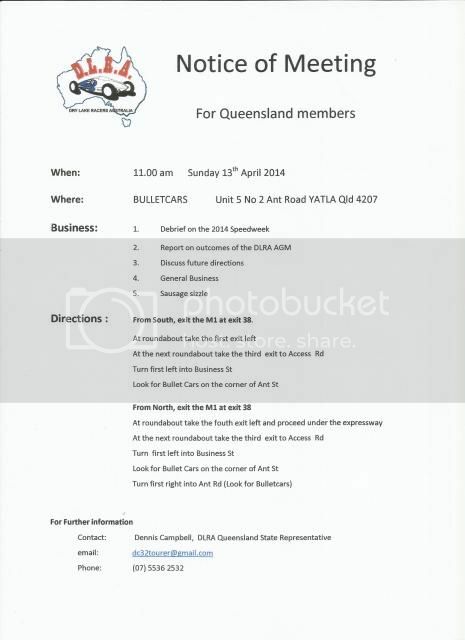 The official notice of the Qld meeting. The minutes of the Queensland General Meeting of 13 April 2014 can now be accessed from the Offline Members area. NOTE: if you are a active (financial) DLRA member and want access to this area, just send me an email quoting your forum name and membership number. And I will notify you when your access is approved. We plan on meeting 2 weeks prior to each Vic general meeting. We will post here when its coming up.